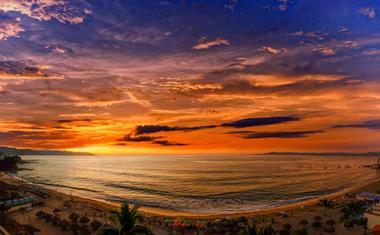 With its beautiful location on the coast of Mexico, Puerto Vallarta is understandably one of the most popular resort towns in Mexico. The city is best known for its proximity to the sparkling waters of the Banderas Bay, which allows you easy access to activities such as snorkeling, scuba diving, and sunset boat tours. 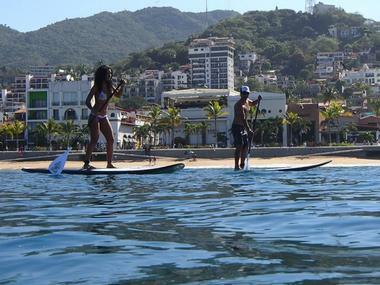 Here are the best things to do in Puerto Vallarta. The Área Natural Protegida Estero El Salado is an urban estuary that is home to a wide variety of fish, reptiles, and other animals. More than 100 different species of birds are known to reside here, making it an excellent destination for birdwatchers of all skill levels. The water is an important egg-laying site for many different kinds of fish, and other interesting inhabitants of the water include the river crocodile, the green iguana, and the garrabo. Opossums and raccoons are frequently spotted in the mangrove. Guided boat tours are available at specific times Tuesdays through Saturdays, and reservations must be made in advance. 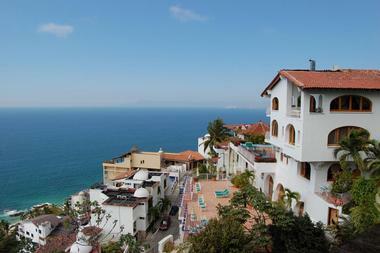 Located on the Pacific Coast of Mexico, Bahía de Banderas is known as the largest bay in the country. There are plenty of things for visitors to do here, but the most popular activity is simply sailing around the bay on one of the many charter boats. One of these boats, known as the Marigalante, is a replica of Christopher Columbus's ship the Santa Maria, and it features an on-board museum that displays various artifacts from the time of the conquistadors. Excellent snorkeling can be found here as well, particularly in the tunnels and coral reefs around the granite Arches Islands. More than just a park, Islas Marietas National Park is a dedicated part of the UNESCO biosphere reserve and a RAMSAR site. Fishing and hunting are not permitted on the islands, so the area is home to a wide variety of wildlife, including whales, seabirds, manta rays, dolphins, and thousands of species of tropical fish. Only select tour companies are permitted to bring guests to the islands, but visitors looking for some fun in the sun can head to the sandy white La Nopalera beach, where they can hop in the water to kayak, surf, snorkel, or stand-up paddleboard. 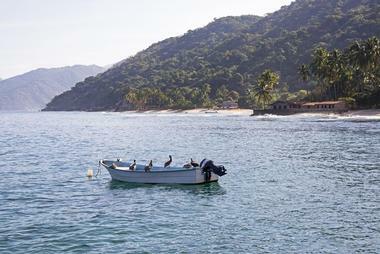 Located to the south of Puerto Vallarta, Las Caletas is a 3/4-mile-long beach that can be reached only by boat. The land is leased by the tour company Vallarta Adventures, and visitors are only granted access to the beach as part of one of the company's tours. 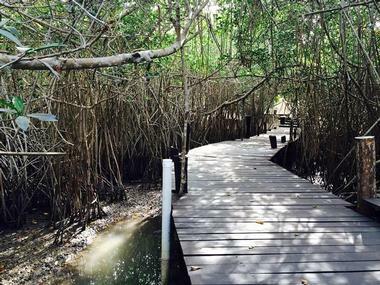 Las Caletas is famous for having been inhabited by Hollywood director John Huston, but today nobody lives here, and visitors can peacefully enjoy the nature trails, spa, and dining areas. Two different tour options are available; one is a full-day excursion while the other includes a sunset cruise, dinner on the beach, and a theatrical performance. 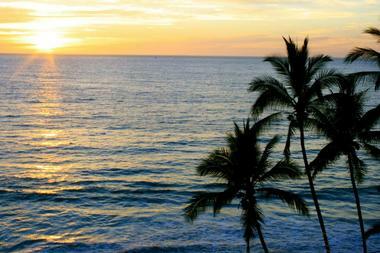 Situated in Puerto Vallarta's Romantic Zone, Los Muertos Beach is the most popular and best-known beach in the area. The beach is a great destination for people of all ages; adults can relax under an umbrella with a cold drink, while children can spend the day splashing around in the waves and building sandcastles. More adventurous visitors can even go parasailing, and the beach also has a wonderful 200-foot pier that makes for a lovely stroll. The beach is known for its beautiful sunsets, and there are plenty of restaurants, cafes, and bars that are open all day and late into the night. Formerly known as the Paseo de la Revolución, the Malecón is a seaside promenade that stretches for approximately 11 blocks through the downtown core of Puerto Vallarta. More than 80% of the Malecón is completely reserved for pedestrians, so visitors can stroll along and take in the sights without having to worry about the traffic. The view of the ocean is enough to make the Malecón worth a visit, but there are plenty of appealing shops, restaurants, local vendors, and bars as well. The space is decorated with local artwork, including sand sculptures, regular sculptures, and intricate Huichol motifs on the ground. 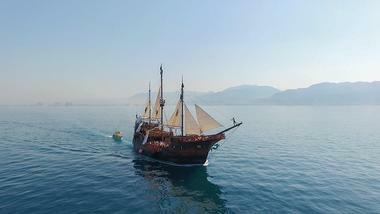 Made from more than 30 species of tropical wood, the Marigalante is an authentic Spanish galleon is built in the exact image of Christopher Columbus's ship the Santa Maria. The ship consists of four decks, can hold up to 240 passengers, and boasts an air-conditioned dining room as well as a fully stocked bar. Several tours are available, including an all-day option with family-friendly activities such as snorkeling and an evening sunset cruise with fireworks and music for dancing. All cruises include meals, an open bar, and an exciting pirate show that is performed in both English and Spanish. 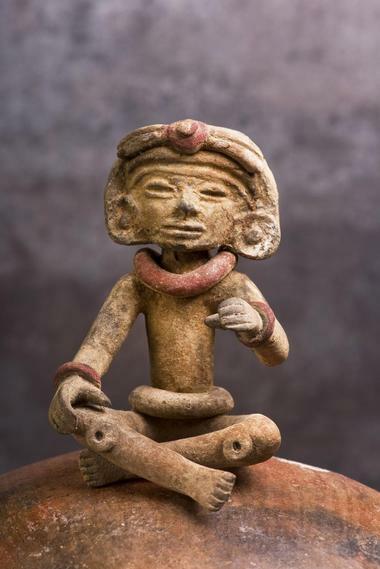 Located on the Isla Río Cuale, Museo del Cuale offers an excellent collection of pre-Hispanic ceramics that date back to between 5000 and 2000 A.C. The collections give a good archaeological introduction to the indigenous peoples who lived in western Mexico during this time, and other items of interest include hunting and gathering tools, various pieces of artwork, and a tomb that was excavated out of Sayula Zacoalco in Jalisco. The information panels on the exhibits are in both English and Spanish, and admission is free of charge. 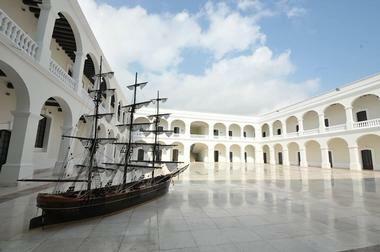 The museum is open Tuesday through Saturday from 10 a.m. until 7 p.m.
Open since 2006. the Museo Naval Secretaria de Marina Armada de México is home to more than 150 different cultural objects related to the Mexican Navy. The museum's interactive exhibits are spread out over 14 different rooms, and highlights include a collection of the various Navy uniforms throughout the years, a navigation simulator, and ship models built to scale. A special event called "Night of Museums" takes place every second Saturday, and visitors can enjoy activities such as concerts, workshop, sailing competitions, and guided tours led by actors playing various characters. The museum is open every day of the week except Monday. Founded by oceanologist Oscar Frey, Ocean Friendly Whale Watching Tours offers environmentally responsible whale watching tours that take into consideration the well-being of the whales as well as the safety of the guests. All of the tours are led by a marine scientist fluent in both English and Spanish, who is assisted by bilingual naturalists. The boat is manned by knowledgeable crew members who have received special safety training. Most tours are either 4.5 or 5.5 hours in length, but customized charter tours can also be arranged. 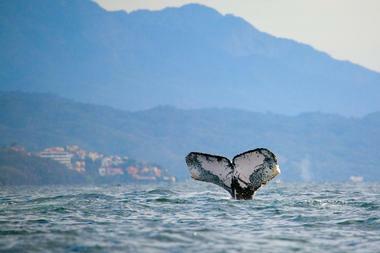 The whale-watching season takes place from December 1st to March 23rd. With branches six 6 different Mexican cities, Olympus Tours stands out from the crowd because of its friendly service and unique tour offerings. The company boasts tours of almost everything the area has to offer, including the historic Romantic Zone, the majestic Sierra Madre mountain range, and the waters of the beautiful Banderas Bay. One of the company's most popular offerings is the Marietas Islands tour, but other excellent options include the outdoor challenge tour and the canopy zip line circuit. Olympus Tours also offers snorkeling, scuba diving, horseback riding, ATV excursions, and the chance to swim with dolphins. Quimixto is a small village in the southern part of the Banderas Bay, and it is best known for its beautiful beach. The town is accessible only by water; many of the beach tours offered in Puerto Vallarta come here, but visitors can also take a water taxi from Boca de Tomatlán or from the pier at Los Muertos Beach. 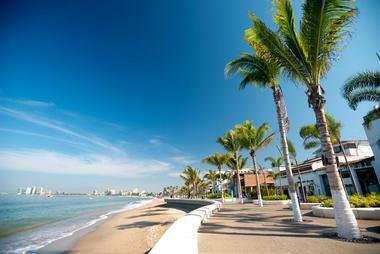 The beach is lined with restaurants serving Mexican cuisine and fresh seafood dishes, and t-shirts and other souvenirs are sold in the village. There is also a waterfall approximately one mile from the beach that can be reached on foot or on horseback. Located right at the foot of the Sierra Madre mountain range, Sayulita is a small but welcoming surf town. 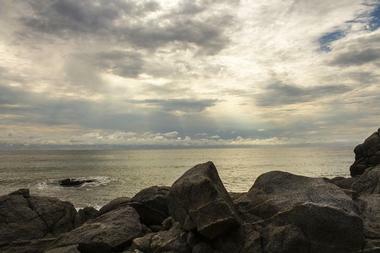 Only 25 miles from downtown Puerto Vallarta, Sayulita can easily be done as a day trip. However, there is plenty of accommodation available for anyone who would like to spend more time here. The town is best known for its consistently excellent surf, but visitors can partake in plenty of other activities as well, including horseback riding, snorkeling, fishing, and various tours that go through the lush jungle canopy. A wide variety of restaurants can be found here as well, including some right on the beach. 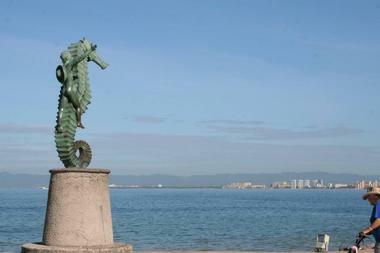 The Seahorse Monument is formally known as "The Boy on the Seahorse," and it is one of the main symbols of Puerto Vallarta. 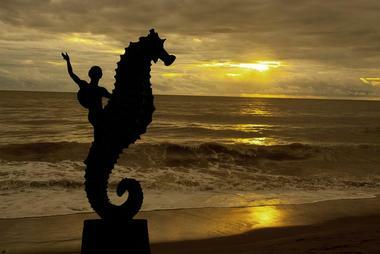 The sculpture was made by artist Rafael Zamarripa Castañeda, and it depicts a naked boy riding a seahorse. 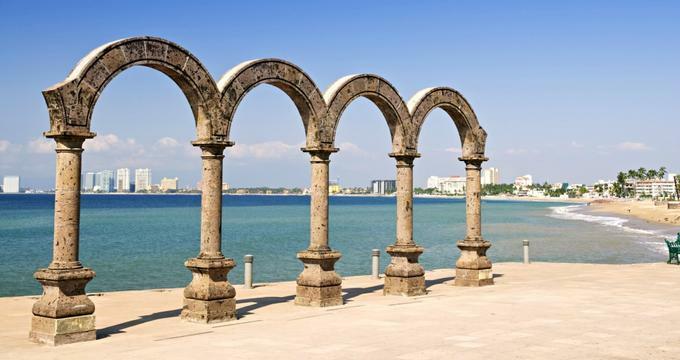 The sculpture was first made in 1960 and placed on Los Muertos Beach, but it was swept away in a storm, and a larger replica was made in 1976 to be placed on the Malecon downtown. The city is now home to two of these monuments; the original sculpture was eventually found and put back in its place on the beach. As one of the largest tour companies in Puerta Vallarta, Vallarta Adventures offers one of the most adrenaline-inducing tours in the area. Known as the Outdoor Adventure Circuit, the tour includes ziplines, jungle bridges, and the opportunity to rappel down waterfalls. 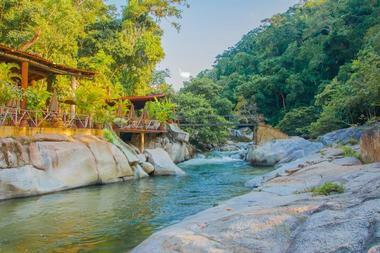 Guests will also have the opportunity to try out two exhilarating waterfalls set right in the jungle. 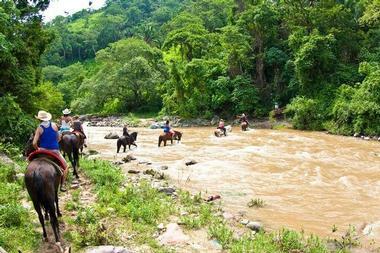 Other tour options include a speedboat ride to a secluded beach, an off-road 4x4 excursion, and a fully-equipped mule trek up the mountain and into the forest. Tours include unlimited bottled water and light refreshments; additional food can be purchased at the base camp if needed. Vallarta Undersea is run by a team of enthusiastic professional divers who teach PADI certified diving courses and lead nature tours by boat in the Bahía de Banderas. Boat tours afford the opportunity to see a variety of animals, including dolphins, turtles, and whales during the winter season. People who have never dived before can participate in the PADI Discover Scuba Program, whereas those with more experience can join one of the dive trips. 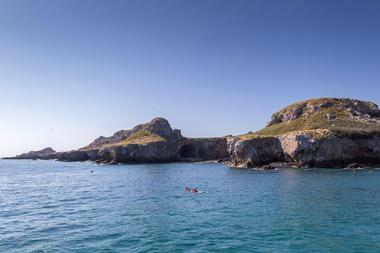 Dive trips depart daily at 9 a.m. and go to various destinations in Los Arcos National Park, Marietas Island National Park, and other dive spots in the south. Founded by a Mexican family who wanted to share their love of Puerto Vallarta with visitors, Xiutla Riders Ecoadventure specializes in private tours that show guests the best that the area has to offer. The company offers an incredible variety of guided tours and other activities, including bicycle tours, scooter tours, stand up paddle boarding lessons, and surfing lessons. Different levels of off-roading ATV experiences are available as well; one of the ATV tour packages includes a thrilling ride on a speedy zipline above the jungle. The company also rents scooters, bikes, ATVs, and paddleboards to guests who want to explore on their own. Family owned and operated, Ada Sailing offers a variety of fully customizable tours in the Banderas Bay. 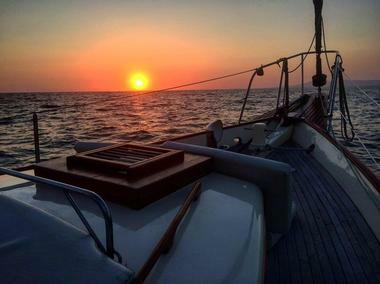 Guests interested in a relaxing sail with spectacular views can hop onboard the Ada, a classic 45' ketch sailboat with a large sundeck. Those looking for a more adventurous experience will find it on the Bruna, a 30' hand craft launch with a greater capability for speed. Popular tour activities include snorkeling, whale watching, and sunset cruises. Guests should note that many tours come with a gourmet lunch or dinner served on the boat and prepared with fresh, local ingredients. Located only one block away from the beach, Banderas Scuba Republic is a certified PADI dive center that offers all levels of PADI certification, from beginner to expert. 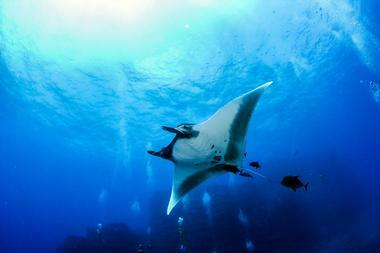 Customers can choose from a good number of dive sites throughout Banderas Bay. Depending on the site and the season, divers can expect to see whales, dolphins, rays, sea turtles, eels, and colorful fish. The company also offers certification courses in a confined water environment; these are held at the Vamar Hotel. Divers who are already certified can charter a boat for the day, and scuba gear is available to rent or to buy. 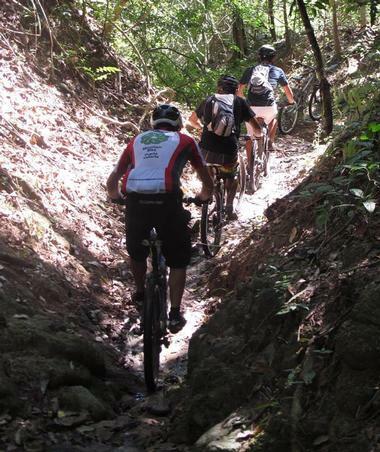 The mountains and jungles around Puerto Vallarta are excellent for mountain biking and hiking, and Eco Ride Mountain Bike & Hiking Tours has been offering high-quality tours of the area since 2002. The company is dedicated to increasing ecological awareness, and they believe in promoting sustainable trail access for hikers and bikers alike. Bike tours range in length from nine miles to 30 miles, and there are options suitable for people of almost every fitness level. The hiking tours offer the opportunity to take in the scenery at a slower pace, and there is also a tour that combines both biking and hiking. 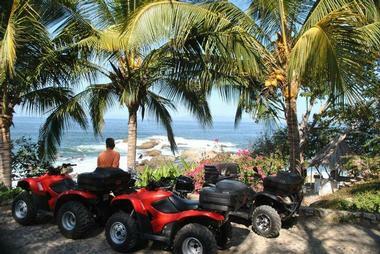 Specializing in ATV tours, Estigo Tours is proud to offer small, personalized excursions led by friendly guides. There are a variety of tours to choose from, including options that wind through lush jungle trails and others that take guests through the historic parts of the city and up into the Sierra Madre mountains. Both one-person and two-person ATVs are available, and drivers are required to have a valid license from their home country. However, the company isn't limited to only ATV tours; they also offer zip-line jungle canopy experiences, boat tours, walking tours, coffee plantation tours, and surfing lessons. 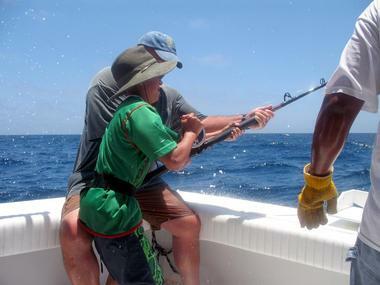 As one of the top fishing charter companies in Puerto Vallarta, Fishing Rebels provides visitors with private fishing charters led by knowledgeable captains. Fishing Rebels is happy to tailor its services for every skill level, and for guests who would like to try something new, the company offers the chance to go bow fishing and target shooting. All of the equipment is new and high-quality, and guests are given the option to catch and release their fish if they wish. 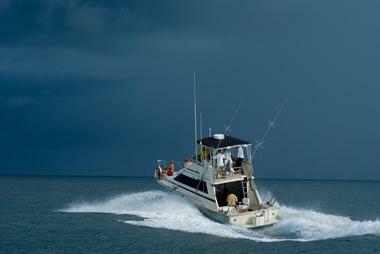 All charters include a valid fishing license and live bait. Fresh ceviche is available upon request. Los Veranos Canopy Tour was the first zip line tour adventure in North America, and it offers guests the exciting opportunity to soar over the lush jungle canopy. There are 14 zip lines totaling more than two miles in length; the largest is 500 feet long, and it allows riders to reach speeds of up to 30 mph. 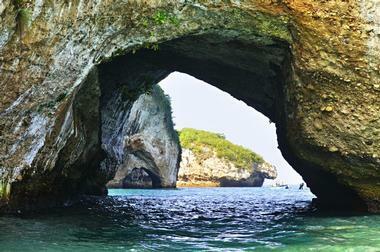 The tours are all led by friendly guides fluent in both Spanish and English and are approximately 4.5 hours in length. Tours begin at the company's Tour Office, and the last zip line brings guests to a tequila bar and restaurant by the river.